Jim McIntosh has practiced taxidermy for the past twenty years. He started his business 'Jims New Life Taxidermy' eight years ago in Morgantown, Kentucky. 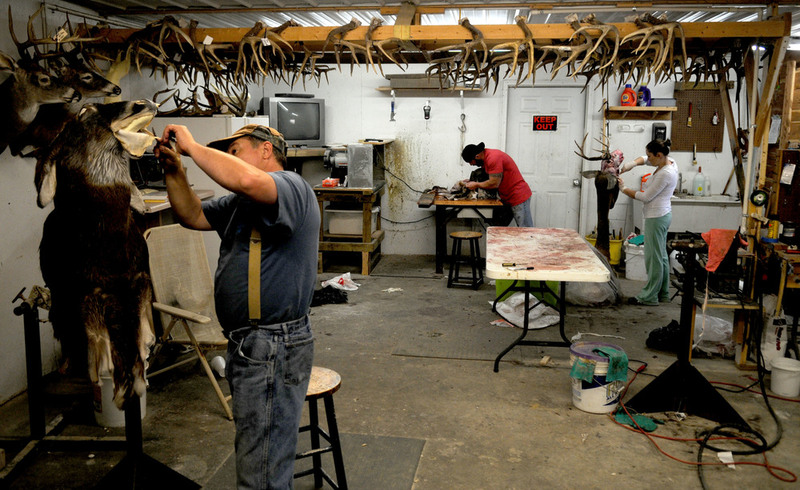 Jim McIntosh (right) works on a deer mount in his Morgantown, Kentucky, taxidermy shop on Wednesday, November fourteenth. Since business is growing, he hired his son, Travis (middle) two months ago to work part time and his daughter Janelle (right) a year ago to work with him five days a week. Jim McIntosh (left), of Morgantown, Kentucky, eats lunch and talks with customer Justus Eaton (right), on Friday, November sixteenth, about the specifics of what kind of deer mount he would like. Eaton traveled from North Carolina specifically to hunt deer in Kentucky. Jim McIntosh works on a deer mount in his Morgantown, Kentucky shop. Total time spent on mounting a deer averages around thirteen working hours. Since there is such a demand for his skill, a completed mount takes around six months to finish. 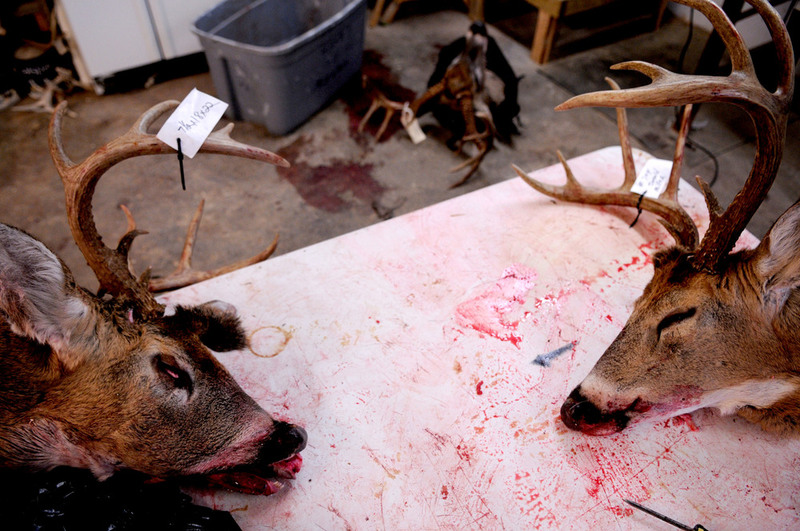 Sever tagged deer heads lay on a table in 'Jims New Life Taxidermy' waiting to be processed. The head will be skinned and the antlers cut off. The leftover meat and bone is often used as coyote bait by local farmers and hunters. Bob McPherson (left) watches as his son Andrew, 10, (center) helps Jim McIntosh (right) skin a deer that Andrew shot earlier that day outside 'Jims New Life Taxidermy' on Friday, November sixteenth. This deer, which was Andrews first ever, will be prepared for a wall mount by Jim within the next six months. McPherson and his son traveled from Virginia to hunt in Kentucky. Jim McIntosh takes a prepared deer into his shop, 'Jims New Life Taxidermy' in Morgantown, Kentucky, on Friday, November sixteenth, to be further prepared for creating a wall mount. For an extra fee, McIntosh will help skin a deer outside his shop. McIntosh has, on average, a years worth of back-ordered taxidermy jobs in his shop.